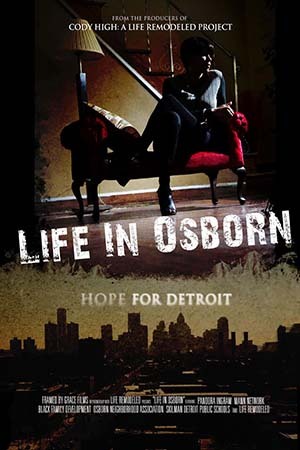 Life in Osborn, a documentary film about the efforts of Detroit-based nonprofit Life Remodeled to transform and improve the lives and the surrounding community of students at Osborn High School, will premiere at the Detroit Institute of Arts’ Detroit Film Theatre next week. The 90-minute film follows the Life Remodeled team as they renovate Osborn High School, remodel homes of the students at the high school, and remove blight and add beautification projects on the blocks surrounding the school. Framed By Grace Films (which also filmed the documentary, Cody High: A Life Remodeled) shows some “amazing life transformations over the course of a year,” Lambert says. Life in Osborn will premiere on Tuesday at the Detroit Institute of Arts. Tickets cost $10 and all proceeds go to Life Remodeled. The film will also air at the Maple Theater in Birmingham and the MJR Theater in Westland next month. Lambert says Life Remodeled will focus their efforts next on Denby High School, which is located three miles away from the Osborn community.